The local Tidy Town Committee has been involved in a major sustainability programme since the beginning of the year. The programme has many different facets to it which the committee will be highlighting throughout the summer months. 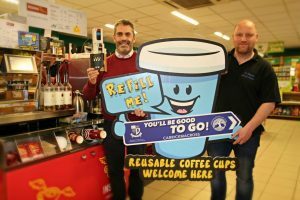 One of the first elements was an awareness campaign concerning the litter problem relating to the disposal of coffee cups along the streets and roadways. 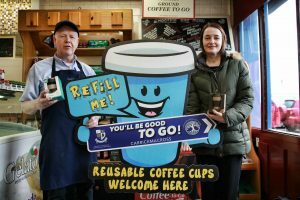 The problem has reached gargantuan proportions nationwide in recent years so Carrickmacross Tidy Town Committee decided to lead the way in improving the situation and called in the assistance of the Local Environment Officer, Nial O’Connor. 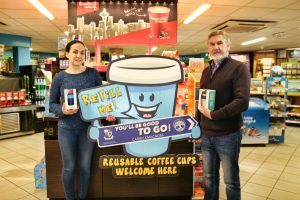 The end result was extremely productive and Carrickmacross set a headline for the rest of the country as far back as February 2018 when the Tidy Town Committee met with eleven establishments in the town that use coffee cups. 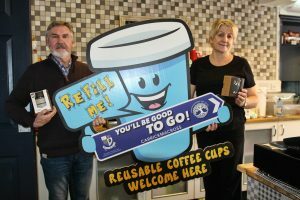 At this joint meeting each of the establishments undertook to get involved in the Conscious Cup campaign locally by creating an environmental awareness around using reusable and compostable coffee cups. 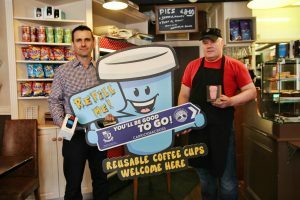 Sample re-usable coffee cups were distributed to each establishment and highlighted in a video campaign which can be seen online. 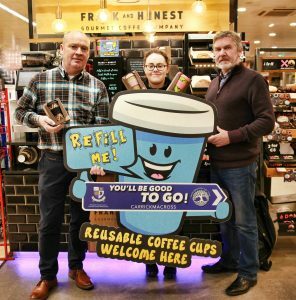 The eleven coffee shops and filling stations vigorously promoted the idea and as an incentive are allowing a 10 cent reduction for customers who bring their own re-usable coffee cups thus reducing the usage of disposable cups and consequently enhancing the local environment. 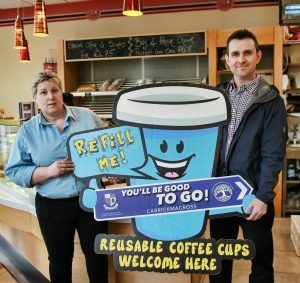 Obviously the success of the campaign will ultimately be determined by the reduction of disposable cups along our streets and roadways and the increased use of compostable and re-usable cups. 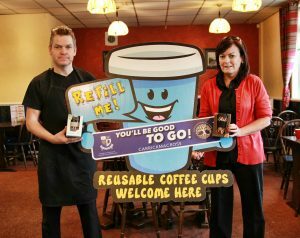 The Tidy Town Committee wishes to thank the businesses who took a very responsible and positive lead in the campaign which will improve our sustainability as a local community. The committee is also grateful to Niall O’Connor of Monaghan County Council for his advice and involvement in the project. 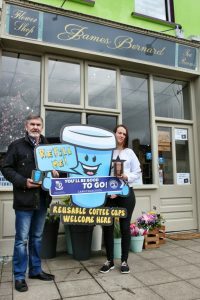 The campaign shows, yet again, that when voluntary and statutory groups work hand in hand with business and industry significant progress can be made in improving the local environment. 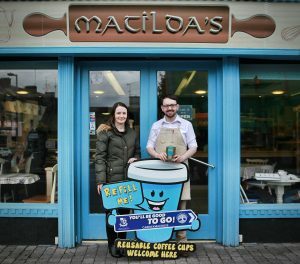 Please ask your local coffee outlet if they are involved in the campaign and do your bit for Carrickmacross. Another first for our progressive Tidy Town Committee in Carrickmacross.